Based upon the knowledge of the importance of minerals to overall well-being, GNLD developed Multi-Mineral plus Alfalfa. It is a broad spectrum formulation containing macro, micro and trace minerals. It was formulated to ensure that those individuals concerned about the total mineral content of their diet could find complete mineral supplementation in one product. To ensure a broad spectrum of trace minerals, GNLD once again turned to nature. Through the review and selection of various natural mineral sources, our Custom Trace Mineral Blend was created. Formulated with a blend of high mineral content sea vegetation and a naturally occurring mineral complex, Custom Trace Mineral Blend provides broad spectrum mineral content in forms drawn directly from nature. To build upon the potency of the Custom Trace Mineral Blend, GNLD chose other naturally occurring mineral sources. The inclusion of each in the formula allowed the researchers to attain predetermined, consistent levels for each mineral. 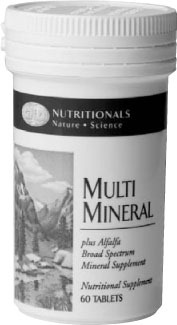 This assures that dietarily significant amounts of each mineral are present and not subject to fluctuations in raw material content. This product represents a unique and exceptionally effective means of providing the body with mineral supplementation from the best possible and most efficient sources. This formula was developed to ensure that desirable minerals are not only provided to the body, but provided in balanced ratios for optimum assimilation and mutual benefit and support. Calcium - Helps maintain healthy bones and teeth. When taken with Calcium, the following nutrients are more effectively utilized: Vitamins A, B-Complex, C, D, Iron, Magnesium, Manganese, Phosphorous and Zinc. Phosphorous - When taken with Phosphorous, the following nutrients are more effective: Vitamins A, B-Complex, C, F, Calcium, Iron, Magnesium, Manganese and Zinc. Phosphorous is present in every cell of the body and plays a part in almost every chemical reaction. Magnesium - When taken with Magnesium, Vitamins B6 and C are more effective. Magnesium acts as a catalyst in the utilization of Carbohydrates, Fats, Proteins, Calcium, Phosphorous and likely Potassium as well. Iron - Ferrous Peptonate is selected for the Iron source because of its ability to be ingested in the presence of certain vitamins without interfering with their utilization. It is also much easier on the digestive tract. Iron is present in every living cell. Iron combined with Copper and Protein forms haemoglobin, the bloodstream’s oxygen transporter. Iron helps maintain healthy red blood cells. Calcium, Cobalt, Copper and Phosphorous are more effective when taken with Iron. Calcium and Copper must be present for Iron to function properly. Zinc - Zinc Gluconate is used, because it is a more readily absorbed form. Vitamin A, Cobalt and Iron are more effective when taken with Zinc. Copper - Copper Gluconate is used, because it is also more readily absorbed. Cobalt, Iron and Zinc are more effective when taken with Copper. Iodine - The sources of Iodine in this product are Atlantic Kelp and Irish Moss selected because of their natural character and their easy assimilation. Potassium - Potassium Carbonate is used because it provides a high potency source which is more easily utilized. Vitamins B6 and B12 are more effective when taken with Potassium. The vegetable form base is selected for the individual naturally occurring mineral contribution of each element. a) Alfalfa - finest naturally occurring deep-rooted Alfalfa plants are rich in Calcium and Vitamin K, and also contain significant amounts of nearly every other vitamin and mineral in their naturally occurring form. b) Irish Moss - an excellent naturally occurring source of Iodine. c) Watercress - particularly rich in Potassium, also contains just about every common mineral. d) Parsley - contains a broad spectrum of naturally occurring minerals, also Calcium and Potassium. e) Chlorophyll - is added because its major constituent is Magnesium. Magnesium is the essential element in the Chlorophyll which gives many plants their green colour. It also gives this product its natural green colour.